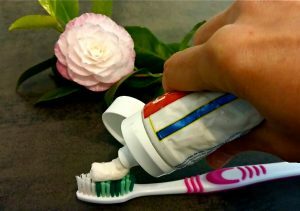 If you have decided to dive into the homemade or reduced-waste lifestyle, chances are you’ve given DIY toothpaste a try. You may have also noticed that there is a lot of compromise involved with most of these: the ones that are coconut oil based can be messy, have a weird texture, and can leave dingy oily spots in your sink, while clay based ones can be bitter, expensive, and impractical. For years I used a concoction that was mainly coconut oil, baking soda, and peppermint essential oil, but I’ll admit that I kinda missed the texture and practicality of the store-bought stuff. Like many others out there though, I stuck with it because I had researched the composition of commercial brands (I encourage you to do so as well), and learned that many of their ingredients are neither good for your health, nor for the environment. 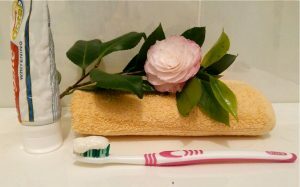 But, FINALLY one day during my endless hours of googling homemade alternatives, I stumbled upon the Farm Girl Inspirations website where the fantastic Melody Joy thankfully shared a recipe for her amazing DIY toothpaste that looks like, and feels like, the store-bought stuff. I’ve been using her recipe for over a year now, and besides it being just awesome, my dentist has approved all the ingredients and its efficacy by looking at my healthy, sparkly teeth! 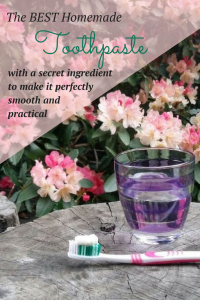 So check out her DIY all-natural Toothpaste post for the simple recipe. Trust me, this will step up your homemade game to expert level! 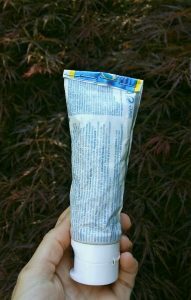 this recipe is enough for 2 tube fulls of toothpaste, so I freeze the unused half until it’s refill time. It doesn’t need to be refrigerated either (win!) – I keep it with my toothbrush near the bathroom sink, and in the month or two it sits there during regular use, it has never yet spoiled. 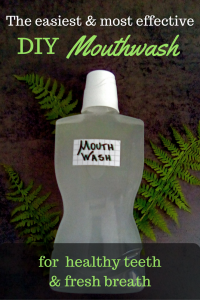 To complete your mouth care routine, check out my simple Homemade Mouthwash recipe that is so easy to make, effective, and once again dentist approved 🙂 Seriously, after trying this recipe you’ll wonder why you’ve spent so many years pouring that money down the drain, or in this case, spitting it in the sink!